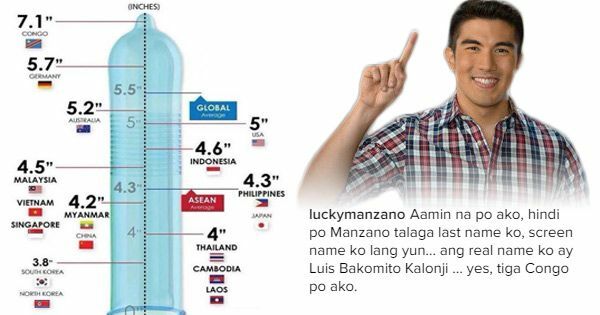 Actor and game show host Luis Manzano revealed in an Instagram post that the size of his manhood is bigger than the global average. According to the image, men from Congo have an average size of 7.1 inches which is 2.8 inches bigger than that of Filipinos. As of 1 p.m. today, the controversial IG post garnered over 2,700 likes. Considering that he is also a comedian, many believe that Luis was not serious. Some wondered how actress Jessy Mendiola, who has been romantically linked to him, would react to such "revelation." Aamin na po ako, hindi po Manzano talaga last name ko, screen name ko lang yun... ang real name ko ay Luis Bakomito Kalonji ... yes, tiga Congo po ako.